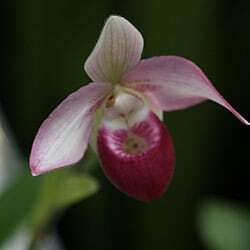 A small genus, Selenipedium Orchids have only six species. They are the least widely grown of the group commonly called ‘Slipper Orchids’, however deserve some attention. The name comes from the Greek words for Moon (Selen) and Pouch (Pedium), so really Moon Pouch or Moon Slipper. In South America, the seed pods were used in the same way as vanilla. The flowers are small, however very attractive. In their native habitat they regarded as vulnerable and close to extinction. These are a tall growing orchid and are only really grown in tropical climates. They are difficult indoors, however a conservatory would work. It is thought that they require a growing medium that is high in iron, which is unusual, however that would match the natural environment. These are an orchid that requires a free draining growing medium. You could use medium pine bark, peat moss or sphagnum moss and charcoal at 5:2:1. Just ensure that the roots never become water logged. An all purpose orchid fertiliser applied in early to late summer every two weeks is usually enough. Make sure that a good watering between fertiliser application is carried to to flush away residual salts. You can also use a fish and seaweed fertiliser. Over fertilisation can cause problems. Always wait until the potting medium begins to dry between watering. Always use clean fresh water and never stand them in water. Light should be filtered, with to little light they tend not to flower. These are an orchid that like warmth, however to much warmth will stunt the growth. Ensure that you do not overpot, and repot every 2 years at least to avoid the potting medium breaking down. Try to use a deep pot as these orchids like to send their roots downward.